Haruko Obokata (小保方 晴子, born in 1983) is a stem-cell biologist and and the Research Unit Leader of the Laboratory for Cellular Reprogramming at RIKEN Center for Developmental Biology. She developed a radical and remarkably easy way to make cells that can grow into any tissue in the body called STAP (Stimulus-Triggered Acquisition of Pluripotency) cells. However, there are many concerns about her researches. "Stimulus-triggered fate conversion of somatic cells into pluripotency"
In Fig1i, the lane 3 was clearly spliced in. 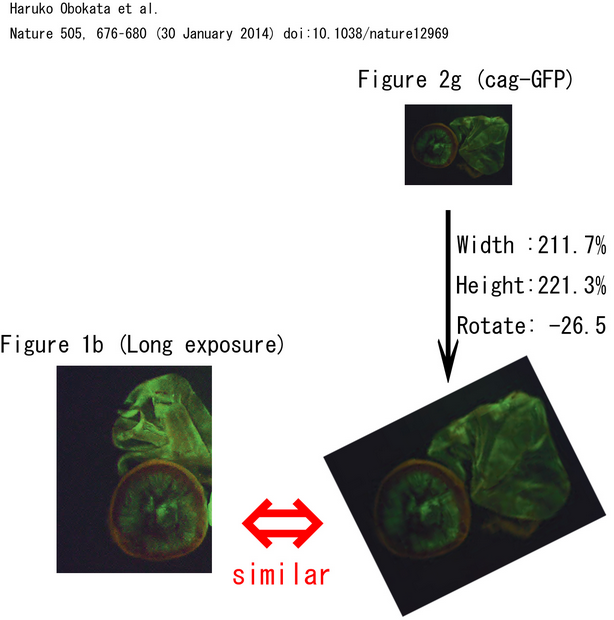 I have found very strange thing in the gel image of Figure 1i of the first Nature paper. As you may know, splicing the lane 3 has ethics problem. But this is not the only problem. Methods says the authors used two primers Dbeta2 and Jbeta2.6 but Ensemble database shows these sequences are only 2.3kB distant from each other. Desipte of this closeness, there is no GL (ie., non-rearranged) TCR DNA band in the lane3. This is very odd given that other lanes show a band at GL and also given that in lane 3 several bands of hundreds bp can be seen. Some are arguing that the authors might have artifically modified manipulated the image but when they did so they were unfamiliar with the TCR gene dynamics. As you may know, TCR beta, unlike TCR alpha, allelic excusion works, and therefore one of the chromosomes has non-arranged TCR. So the lane 3 should show the GL band easily. 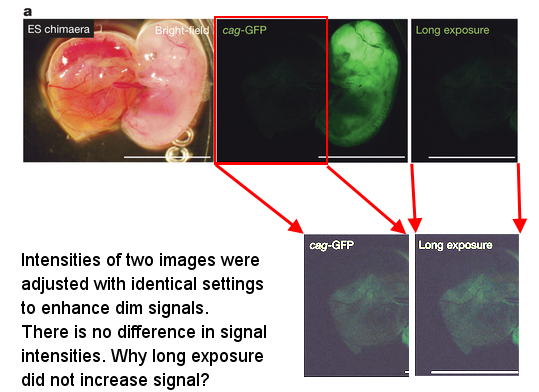 "Bidirectional developmental potential in reprogrammed cells with acquired pluripotency"
The parts of placentas of Fig.1b (Long exposure) and Fig.2g (cag-GFP) in this paper were very similar to each other. The image of Fig.1b is for the chimaeric fetus derived from the STAP cell. 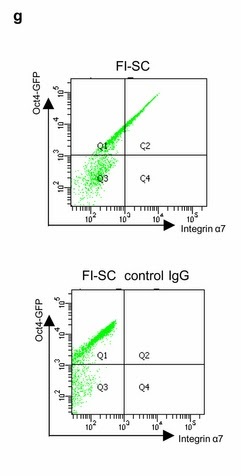 On the other hand, the image of Fig.2g is for the chimaeric fetus derived from the Fgf4-induced stem cell. In short, these two images were gotten in independent experiments with different methods, and this image similarity is very disconcerting. Compare placentas of the above two images. Compensation is needed to eliminate false signal that results from spectral overlap between fluorescent dyes. "The potential of stem cells in adult tissues representative of the three germ layers"
The Fgf5 samples from Fig2 look very like those for Nat1 from Fig3. In Fig.3, the vertically flipped version of Klf4 bands image is similar to the Cripto bands image. 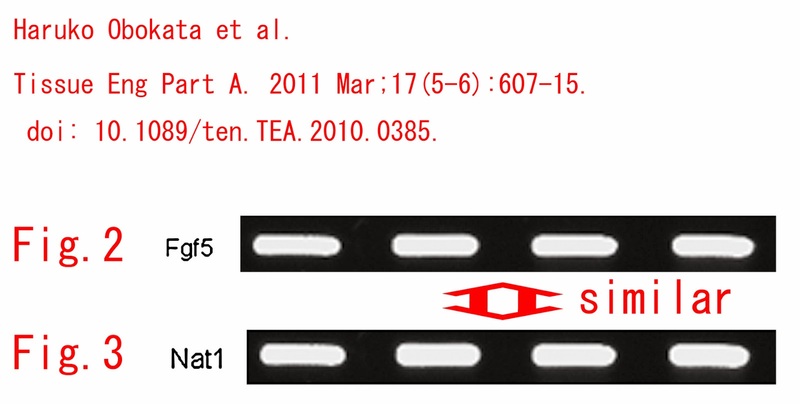 Furthermore, the lane 1 and 2 bands of the above image are similar to Nat1 bands of Fig.4. The lanes 1 and 2 of Klf4 from Fig.2 are the lanes 3 and 4 of Sox3 from Fig.3. 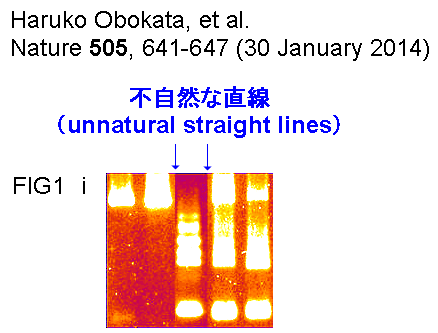 Obokata's Nature Article：　"Stimulus-triggered fate conversion of somatic cells into pluripotency"
Karyotype analysis was performed by Multicolor FISH analysis (M-FISH). Subconfluent STAP stem cells were arrested in metaphase by colcemid (final concentration 0.270 µg ml−1) to the culture medium for 2.5 h at 37 °C in 5% CO2. Cells were washed with PBS, treated with trypsin and EDTA (EDTA), re-suspended into cell medium and centrifuged for 5 min at 1,200 r.p.m. To the cell pellet in 3 ml of PBS, 7 ml of a pre-warmed hypotonic 0.0375 M KC1 solution was added. Cells were incubated for 20 min at 37 °C. Cells were centrifuged for 5 min at 1,200 r.p.m. and the pellet was re-suspended in 3–5 ml of 0.0375 M KC1 solution. The cells were fixed with methanol/acetic acid (3:1; vol/vol) by gently pipetting. Fixation was performed four times before spreading the cells on glass slides. For the FISH procedure, mouse chromosome-specific painting probes were combinatorially labelled using seven different fluorochromes and hybridized as previously described41. For each cell line, 9–15 metaphase spreads were acquired by using a Leica DM RXA RF8 epifluorescence microscope (Leica Mikrosysteme GmbH) equipped with a Sensys CCD camera (Photometrics). Camera and microscope were controlled by the Leica Q-FISH software (Leica Microsystems). Metaphase spreads were processed on the basis of the Leica MCK software and presented as multicolour karyograms. Guo J's paper：　Multicolor karyotype analyses of mouse embryonic stem cells. In Vitro Cell Dev Biol Anim. 2005 Sep-Oct;41(8-9):278-83. Guo J1, Jauch A, Heidi HG, Schoell B, Erz D, Schrank M, Janssen JW. 1Institute of Human Genetics, University of Heidelberg, D-69120 Heidelberg, Germany. Metaphase spreads of the ES cells were performed as follows. Subconfluent ES cells were arrested in metaphase by adding colcemid (final concentration 0.270 μg/ml) to the culture medium for 2.5 h at 37° C in 5% CO2. Cells were washed with PBS, treated with trypsin-ethylenediaminetetraacetic acid (EDTA), resuspended into cell medium and centrifuged for 5 min at 1200 rpm. To the cell pellet in 3 ml of PBS, 7 ml of a prewarmed hypotonic 0.0375 M KCl solution was added. Cells were incubated for 20 min at 37° C. Cells were centrifuged for 5 min at 1200 rpm and the pellet was resuspended in 3–5 ml of 0.0375 M KCl solution. The cells were fixed with methanol/acetic acid (3:1, vol:vol) by gently pipetting. Fixation was performed four times prior to spreading the cells on glass slides. For M-FISH analysis mouse chromosome–specific painting probes were combinatorially labeled using seven different fluorochromes and hybridized as previously described (Jentsch et al., 2003). For each cell line 9–15 metaphase spreads were acquired by using a Leica DM RXA RF8 epifluorescence microscope (Leica Mikrosysteme GmbH, Bensheim, Germany) equipped with a Sensys CCD camera (Photometrics, Tucson, AZ). Camera and microscope were controlled by the Leica Q-FISH software (Leica Microsystems Imaging solutions, Cambridge, United Kingdom). Metaphase spreads were processed on the basis of the Leica MCK software and presented as multicolor karyograms. Karyotype analysis. Karyotype analysis was performed by Multicolor FISH analysis (M-FISH). Subconfluent STAPS cells were arrested in metaphase by colcemid (final concentration 0.270 μg/ml) to the culture medium for 2.5 h at 37°C in 5% C02. Cells were washed with PBS, treated with trypsin/ethylenediaminetetraacetic acid (EDTA), resuspended into cell medium and centrifuged for 5 min at 1200 rpm. To the cell pellet in 3 ml of PBS, 7 ml of a prewarmed hypotonic 0.0375 M KC 1 solution was added. Cells were incubated for 20 min at 37°C. Cells were centrifuged for 5 min at 1200 rpm and the pellet was resuspended in 3-5 ml of 0.0375 M KC1 solution. The cells were fixed with methanol/acetic acid (3: 1; vol/vol) by gently pipetting. Fixation was performed four times prior to spreading the cells on glass slides. For the FISH procedure, mouse chromosome-specific painting probes were combinatorially labeled using seven different fluorochromes and hybridized as previously described (Jentsch et al, 2003). For each cell line, 9-15 metaphase spreads were acquired by using a Leica DM RXA RF8 epifluorescence microscope (Leica Mikrosysteme GmbH, Bensheim, Germany) equipped with a Sensys CCD camera (Photometries, Tucson, AZ). Camera and microscope were controlled by the Leica Q-FISH software (Leica Microsystems hanging solutions, Cambridge, United Kingdom). Metaphase spreads were processed on the basis of the Leica MCK software and presented as multicolor karyograms. Nature Article：　"Stimulus-triggered fate conversion of somatic cells into pluripotency"
Karyotype analysisKaryotype analysis was performed by Multicolor FISH analysis (M-FISH). Subconfluent STAP stem cells were arrested in metaphase by colcemid (final concentration 0.270 µg ml−1) to the culture medium for 2.5 h at 37 °C in 5% CO2. Cells were washed with PBS, treated with trypsin and EDTA (EDTA), re-suspended into cell medium and centrifuged for 5 min at 1,200 r.p.m. To the cell pellet in 3 ml of PBS, 7 ml of a pre-warmed hypotonic 0.0375 M KC1 solution was added. Cells were incubated for 20 min at 37 °C. Cells were centrifuged for 5 min at 1,200 r.p.m. and the pellet was re-suspended in 3–5 ml of 0.0375 M KC1 solution. The cells were fixed with methanol/acetic acid (3:1; vol/vol) by gently pipetting. Fixation was performed four times before spreading the cells on glass slides. For the FISH procedure, mouse chromosome-specific painting probes were combinatorially labelled using seven different fluorochromes and hybridized as previously described41. For each cell line, 9–15 metaphase spreads were acquired by using a Leica DM RXA RF8 epifluorescence microscope (Leica Mikrosysteme GmbH) equipped with a Sensys CCD camera (Photometrics). Camera and microscope were controlled by the Leica Q-FISH software (Leica Microsystems). Metaphase spreads were processed on the basis of the Leica MCK software and presented as multicolour karyograms. The genomic and transcriptomic landscape of HeLa cells. Metaphase spreads of HeLa cells were performed as follows. Subconfluent HeLa cells were arrested in metaphase by adding colcemid (final concentration 0.270 μg/ml) to the culture medium for 2.5 h at 37° C in 5% CO2. Cells were washed with PBS, treated with trypsin-ethylenediaminetetraacetic acid (EDTA), resuspended into cell medium and centrifuged for 5 min at 1200 rpm. To the cell pellet in 3 ml of PBS, 7 ml of a prewarmed hypotonic 0.0375 M KCl solution was added. Cells were incubated for 20 min at 37° C. Cells were centrifuged for 5 min at 1200 rpm and the pellet was resuspended in 3–5 ml of 0.0375 M KCl solution. The cells were fixed with methanol/acetic acid (3:1, vol:vol) by gently pipetting. Fixation was performed four times prior to spreading the cells on glass slides. For M-FISH analysis, chromosome–specific painting probes were labeled using DOP-PCR amplified DNA using 7 different fluorochromes in a combinatorial manner and hybridized as previously described . Twelve metaphase spreads were acquired by using a Leica DM RXA RF8 epifluorescence microscope (Leica Mikrosysteme GmbH, Bensheim, Germany) equipped with a Sensys CCD camera (Photometrics, Tucson, AZ). Camera and microscope were controlled by the Leica MCK-FISH software (Leica Microsystems Imaging solutions, Cambridge, United Kingdom). 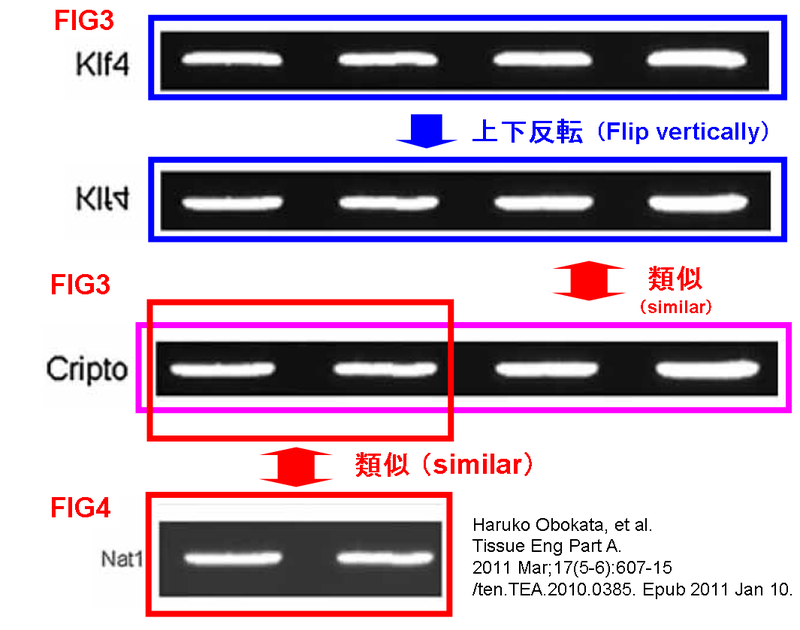 Metaphase spreads were processed on the basis of the Leica MCK software and presented as multicolor karyotypes. Seven-fluorochrome mouse M-FISH for high-resolution analysis of interchromosomalrearrangements. Jentsch I1, Geigl J, Klein CA, Speicher MR.
Institut für Humangenetik, Technische Universität München, München, Germany. Preparation of mouse painting probes and of fluorochrome DNA pools The generation of mouse chromosome-specific painting probes (Rabbitts et al., 1995) and their amplification by “primary” and “secondary DOPPCR” was described previously (Jentsch et al., 2001). Similar to our human 7-Fluor M-FISH approach (Azofeifa et al., 2000) we generated a DNA pool for each fluorochrome according to the labeling scheme shown in Fig. 2. For example, the DEAC-pool consisted of painting probes for chromosomes 3, 5, 10, 11, 14, and Y; the FITC pool of chromosomes 3, 8, 13, 15, 19, and X, and so on. Each painting probe was carefully calibrated to have the same fluorescent intensity after FISH according to our previously described protocols (Eils et al., 1998). After PCR labeling, the length of the DNA was adjusted by DNase I digestion to a size of 300– 700 bp. Preparation of the mouse M-FISH hybridization mix The hybridization mix was prepared by overnight ethanol precipitation of 6 Ìl of the DEAC-, 7 Ìl of the FITC-, 6 Ìl of the Cy3-, 2.5 Ìl of the Texas Red- (= Cy3.5), 6 Ìl of the Cy5-, 2.5 Ìl of the biotin- (= Cy5.5) and 3 Ìl of the digoxigenin- (= Cy7) labeled PCR product, together with 60 Ìl of mouse Cot-1 DNA and 20 Ìg salmon sperm DNA. After centrifugation at 13,000 rpm for 30 min at 4 ° C followed by a washing step with 70 % ethanol, the pellet was resuspended in the hybridization mix, consisting of 50 % formamide, 20% dextran sulfate, and 2× SSC. Induction of chromosomal aberrations and preparation of mouse chromosomes The mouse chromosome preparations from mouse cell lines AG12 TUBO and TSA were done as described previously (Weaver et al., 1999) with some modifications. In brief, the spleen was isolated from mouse and transported in a tissue culture flask with RPMI/FBS. After homogenization with RPMI, the cells were incubated in a culture flask with RPMI, FBS, concanavalin A, LPS, ß-mercaptoethanol. After 48 h incubation, the cells were treated with colcemid and 0.075 M KCl and fixed in methanol/acetic acid. Hybridization, post-hybridization washes and detection of indirectly labeled probes The probe mixture was denatured for 7 min at 78 ° C and then preannealed for about 20 min at 37 ° C. The slides were denatured in 70 % formamide, 2× SSC for about 2.5 min at 72 ° C. After passage through an ethanol series on ice, the slides were air-dried and the hybridization mixture was added to the slide. The hybridization field was sealed with a cover slip and rubber cement, and the slides were incubated for two nights at 37 ° C.
Following hybridization, the slides were washed in 4× SSC/Tween three times 5 min each at 42 ° C to remove the cover slip and then three times (5 min each) with 1× SSC at 60 ° C. The slides were blocked in 3% BSA in 4× SSC/Tween and incubated for 30 min at 37 ° C. After blocking, avidin Cy5.5 (1:100 in 4% SSC/Tween plus 1% BSA) and anti-digoxigenin-Cy7 (1:50 in 4× SSC/Tween plus 1% BSA) were added to the slides and incubated for at least 45 min in a moist chamber at 37 ° C. The slides were then washed three times (5 min each) in 4× SSC/Tween at 45 ° C, counterstained with DAPI (4),6-diamidino-2-phenylindole) and mounted in p-phenylenediamine dihydrochloride antifade solution. 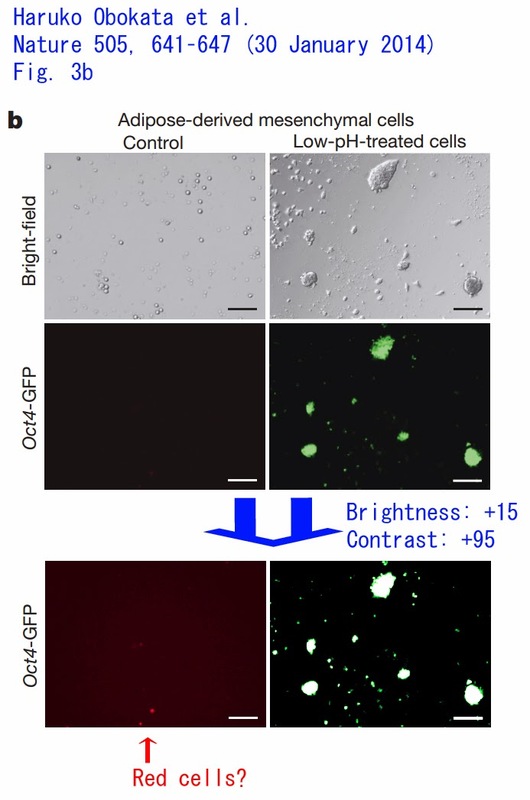 Epifluorescence microscopy Slides were visualized using a Leica DMRXA-RF8 epifluorescence microscope equipped with special filter blocks (Chroma Technology, Brattleboro, VT) as described (Eils et al., 1998). For image acquisition, a Sensys CCD camera (Photometrics) with a Kodak KAF 1400 chip was used. Both the camera and microscope were controlled with Leica Q-FISH software (Leica Microsystems Imaging Solutions, Cambridge, UK). Images were analyzed using the Leica MCK-Software package (Leica Microsystems Imaging Solutions, Cambridge, UK/Eils et al., 1998). "Reproducible subcutaneous transplantation of cell sheets into recipient mice"
Development of osteogenic cell sheets for bone tissue engineering applications. 2011 Jun;17(11-12):1507-15. doi: 10.1089/ten.TEA.2010.0470. Epub 2011 Apr 12. Pirraco RP1, Obokata H, Iwata T, Marques AP, Tsuneda S, Yamato M, Reis RL, Okano T.
1Institute of Advanced Biomedical Engineering and Science, Tokyo Women's Medical University, Tokyo, Japan. - A crowdsource page for people who want to post their findings on their attempts to validate the STAP stem cell ( ＳＴＡＰ細胞) method. The Riken research institute said Feb. 14 it has begun an investigation into claims of irregularities in data images associated with the discovery of stimulus-triggered acquisition of pluripotency (STAP) cells. The cells were recently discovered by a team of Japanese and U.S. researchers led by Haruko Obokata of the Riken Center for Developmental Biology. "We do not believe that there is any problem with the findings themselves," commented Riken's public relations department in response to the allegations, which were made on several Internet sites. Riken said its inquiry is being conducted by several experts including some not affiliated with the agency. The probe is focusing on two papers published Jan. 30 in the British journal Nature. The articles outline the process by which simply introducing stress to lymphocyte cells in mice can enable pluripotency, whereby the cells can turn into any other kind of body cells. The claims include allegations that "some of the data images used in the essays appear to have been tampered with," and ones about the multiple use of a photo of the placenta claimed to have been created from STAP cells. The inquiry began on Feb. 13, and Obokata and other team members were consulted on Feb. 13 and 14. Results of the probe will be announced as soon as a conclusion has been reached. "At this point in time, our judgment is that the research findings are solid," a Riken representative commented. "However, we are undertaking an inquiry, since claims were made from outside the institution." This English blog was partly translated from the following Japanese version. Please also refer to the following Japanese blog by another author.